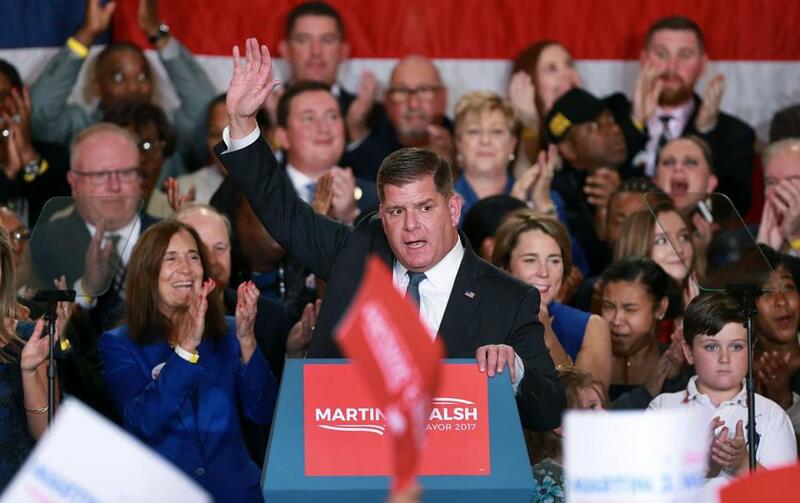 What will Marty Walsh do with his new-found power? 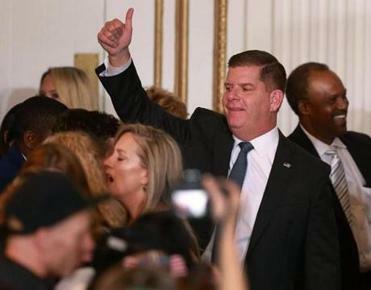 Confetti fell from the ceiling of the Copley Plaza Hotel’s grand ballroom after Mayor Martin J. Walsh secured his second term in office. By his own admission, Marty Walsh was not an instant success as the 45th mayor of Boston. The former state representative from Dorchester took office in 2014 as a relatively little-known quantity to broad swaths of the city he now ruled. His grasp of city government was shakier than he realized; he would learn that City Hall is not a scale-model version of the State House but a substantially different entity, with different powers and priorities. It didn’t help that he was following the indomitable Thomas M. Menino, one of the most popular mayors in Boston’s history. But four years is a long time in the life of a city, and in the education of a mayor. Voters swept Walsh into a second term Tuesday, handing him a resounding victory over Councilor Tito Jackson. Turnout was small, but the mandate is clear. His relatively narrow margin of four years ago swelled into a landslide on Tuesday — and with that landslide come new opportunities. Walsh handily defeated City Councilor Tito Jackson to remain in office. Walsh has emerged as a force for both stability and innovation. He sought to modernize the way business is done in City Hall. He has been a mayor who does not personalize major decisions, as his predecessor was wont to do. Jackson ran on a promise to address the income inequality that has widened as the city prospered. If there are, as he insisted, “Two Bostons,” the one that votes likes Walsh’s leadership. That Boston is doing great. Now Walsh has the chance to pursue the priorities that will define his legacy. Governing during a development boom, he has been an unabashed champion of growth. He counts bringing General Electric’s headquarters to town among his greatest triumphs, and seems poised to pour even more effort, if that’s possible, into winning the second headquarters Amazon plans to build. Both are worthy projects for the city. But the new condominium towers and soaring property values that Walsh takes pride in also pose significant challenges. The flip side of a city on fire is that many working-class residents, especially renters, are barely hanging on to their perch in the neighborhoods. One of the most interesting questions facing Boston may be who is going to be able to afford to live here when we next elect a mayor. Other concerns facing Walsh are more prosaic. The end of a mayor’s first term is traditionally a time of taking stock for those around him. Already, Walsh has lost his talented chief of staff, Daniel Koh, who is mounting a run for Congress in the Third Congressional District. Other key members of his team will also face decisions about whether to stay or go. That’s normal, but that doesn’t mean it won’t be unsettling. Walsh’s first term, of course, has not been an unqualified success. The city’s Olympic bid became a quagmire. Walsh was for it before he was against it, miscalculating the opposition to what would have been a risky financial endeavor. The IndyCar race planned for the South Boston Waterfront in 2016 went from a goofy, bad idea to a matter of broken promises and litigation — a lesson, perhaps, in asking more questions about a project before lending his imprimatur. Two aides, Ken Brissette and Timothy Sullivan, await federal trial on charges that they improperly influenced vendors to hire union workers. Their trial will not be a pleasant experience for the labor-boss-turned-mayor, though the prospect of further indictments seems to have evaporated. So what does Walsh do now? One veteran political insider suggested yesterday that it may be time to focus on a handful of serious priorities that will define his legacy, and less time at public events. In a city that shows no sign of cooling down, development will remain a major priority. But Walsh will face pressure to continue to find creative ways to develop more affordable housing at the same time. The Boston Public Schools, while marginally improved, continue to be a source of concern. Look no further than the continued failure that is Madison Park High School to see how much work remains to be done. Race relations continue to define the city, not always in flattering ways. Walsh has instituted a series of dialogues on the subject to get people talking across racial lines. In his second term, he will have to figure out how to build on that modest effort. The issue is not just social, it is economic, too. With the city in the midst of a long-running boom, figuring out how to share the city’s success is as pressing question as any Walsh will face. Still, Walsh has come a great distance in four years. If he is mayor at an especially opportune time, he has made the most of the opportunity. But resting on his laurels isn’t an option. The hunger that carried him into office will be just as vital as he continues to build the new Boston.